Every week, the Greensburg/Decatur County Animal Shelter will provide photos and information of pets available for adoption. Every pet adopted from the shelter is vaccinated, has been treated for parasites and is spayed or neutered, all of which is included in the adoption fee. Would-be pet owners must be aware that there is a leash ordinance in the city and in the county, pets must not roam from the owner’s property. The Animal Shelter is open Tuesday, Thursday and Friday from 10 a.m. to 4 p.m., Wednesday from noon to 6 p.m. and Saturday from 10 a.m. to 1 p.m. The shelter is always closed on Sundays, Mondays and holidays. The Greensburg/Decatur County Animal Shelter is located at 1635 West Park Road and can be reached at 812-663-9081. To adopt a pet from the shelter, one must be at least 18 years old and sign a contract. Before taking a pet home to a rental home or apartment, written consent from the landlord must be presented. Prospective owners must also have containment options other than chaining available for the pet. Found pets have a three day hold during which they cannot be adopted. If no owners contact the shelter in that time period, a found pet may be sent to a new home. 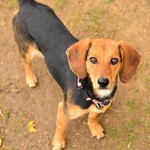 Katrina, a young beagle mix that came to the shelter in October with an injured leg. Some tender, loving care was all it took for this bright-eyed girl to get back on her feet and ready to play. Animal control manager Laura Johnston reported that Katrina is okay with most other dogs and is not interested in cats. Katrina has tested negative for heartworms and has been vaccinated and treated for parasites. This young dog is partially house trained. Her adoption fee is $100, which includes her spay.